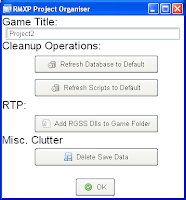 This nifty little utility (from Evil Cabbage), just as the title suggests, gives you the chance to easily manage all your RMXP projects. 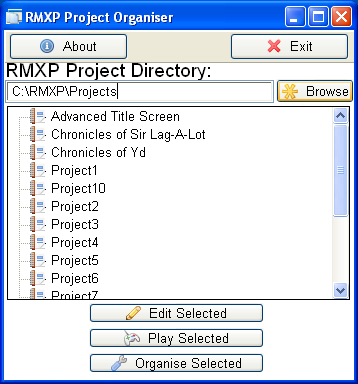 First off, you can launch or edit projects directly from the program, making it much easier than loading them individually in RMXP first. 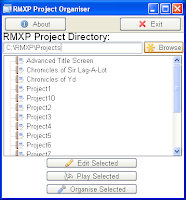 Note: You can launch RMVX projects as well, although you can’t edit them without receiving an error message. This application is packed with other very useful features. 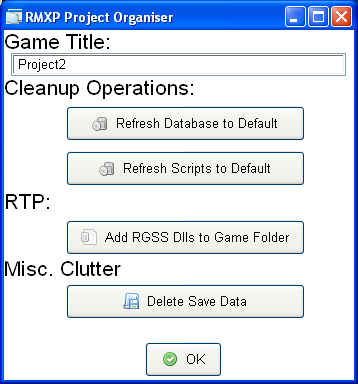 You can change the game’s title, restore the database and scripts in a project to default, delete unwanted save files rather than manually in the project folder itself, and if any RGSS dlls are required it can copy these as well. There is, however, one very important caveat to be aware of: If you don’t highlight a project first, the program will crash! Aside from that, this program is definitely useful, especially as a launchpad for editing and playing projects.